As soon as I decided to learn to crochet, I began collecting yarn like a maniac. A ball of this, a skein of that. I have tons of mismatching yarn and scraps leftover from projects sitting in my closet. 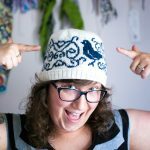 I started following @KnitsforNeeds to help myself find some new projects and inspiration because I haven’t been knitting or crocheting much lately. Knits for Needs is a charity that you can donate knitted and crocheted items to throughout the year to help those in need. Most recently, Knits for Needs has posted about Prayer Squares, four-inch knitted or crocheted squares used while praying. Prayer Squares sent to Knits for Needs will be sent to Knit Wits who attach charms and prayers to the squares before donating them to chemo patients in cancer centers. These Prayer Squares are great for using up leftover yarns and yarn you just don’t know what to do with. Soft yarns will work best as they’ll be more comfortable to hold (- don’t use wool). For more information, read Knits for Needs Prayer Square blog post and/or join in the discussion on Ravelry. I’ve started my Prayer Square and will post pictures when I’m finished. Is anyone else working on Prayer Squares? They’re a quick and easy project that will help give someone a little comfort, so I urge those of you that knit or crochet to start a Prayer Square and send it to Knits for Needs. Next PostNext I’m knitting again!